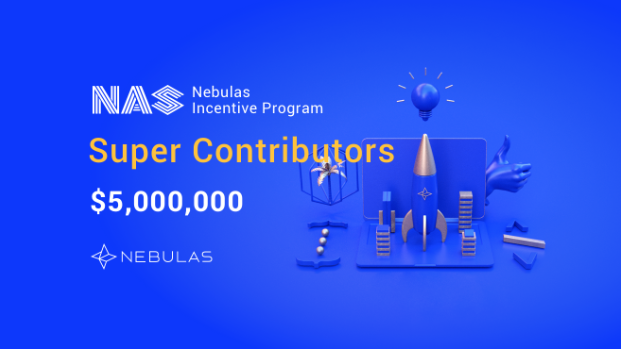 Nebulas, a new-generation blockchain ecosystem, is broadening its Incentive Program by introducing Super Contributor incentives. The Nebulas Incentive Program rewards developers and referrers who bring quality decentralized applications to the Nebulas blockchain. With Super Contributors, community members will now be able to win NAS rewards simply for inviting more people to join the Nebulas ecosystem. Super Contributors will share a 10,000 NAS reward, and will also be able to vote on the best Dapps each week in the Nebulas Incentive Program. The Nebulas Incentive Program, which rewards developers and referrers who bring high-quality decentralized apps (Dapps) to the Nebulas blockchain, is being upgraded. On June 10, 2018 (UTC+8), the Program will introduce Super Contributors, a new referral program that rewards those who invite new users to the Nebulas ecosystem. This will add both a new method to earn NAS rewards, and voting rights for the community, within the Nebulas Incentive Program. Super Contributor incentives are a new referral plan within the Nebulas Incentive Program. Currently, The Nebulas Program is comprised of two reward streams: Developer and Referral rewards. Developer rewards are distributed to those who build the best Dapps on Nebulas. Referral rewards, meanwhile, are distributed to those who convert the greatest number of developers to build Dapps on the Nebulas (an invited developer that registers on Nebulas but does not build a dapp is not counted as a successful referral). With Super Contributors, Nebulas will reward those people and organizations that invite any users, including developers and non-developers, to the Nebulas ecosystem. The top-20 accounts that invite the most people to sign up to Nebulas will become Super Contributors. They will share a weekly 10,000 NAS prize amongst them, and also have the chance to decide the Champions, Weekly Developer Champions, second- and third-prize receiver, by voting for the best three Dapps each week. This Super Contributor upgrade introduces the process of “proof of participation” in the Nebulas ecosystem, and is an early experiment for implementing the Proof of Devotion consensus protocol on Nebulas blockchain. Furthermore, involving Super Contributors in the decision-making process for determining the best Dapps in Nebulas Incentive Program is a step towards achieving a fully autonomous blockchain ecosystem run by the community. The Super Contributor mechanism will take effect on June 10th, 2018, and run for a four-week period until July 8, 2018. To win a chance to become a Super Contributor, users need only register on the Nebulas Incentive Program website (incentive.nebulas.io) and obtain a unique invitation, and then invite others to register on Nebulas using this code. All community members, industry media, influencers, exchanges, and other groups and individuals, are encouraged to participate. The Nebulas Chain (NAS) is a new generation of public blockchain and dedicated to building a collaborative ecosystem with sustainable upgrading, and its mainnet was launched on March 30th, 2018. Nebulas features an original blockchain value discovery system, forward-looking incentive and consensus mechanisms, and the ability to avoid hard forks through self-evolution. The main Nebulas blockchain network launched on March 30th, and this was followed by the debut of the Nebulas Incentive Program at the beginning of May. Since then, nearly 3,000 Dapps have been deployed on Nebulas, surpassing the number of Dapps on Ethereum.